What you put into your body is what you get out of it, so before you take your next bite remember – you are what you eat! So…What’s Good for you? White fruits and vegetables take their ‘colour’ from pigments called anthoxanthins, these contain health promoting chemicals such as allicin which may help lower cholesterol and blood pressure as well as supporting healthy immune function. Sufficient servings of white foods also boost the body’s natural potassium levels which also boost and support nerve and muscle function. 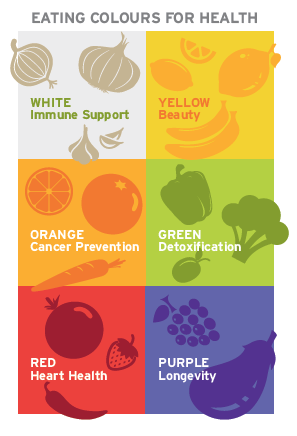 Orange and yellow fruits and vegetables contain antioxidants, carotenoids and other essential vitamins. Regular servings of orange and yellow produce can help improve eyesight, boost immunity; are great for skin, and are essential for growth and development. Green leafy veggies and bright green fruit contain powerful phytochemicals such as indoles. Green produce are high in essential vitamins, which support cell health, help to reduce cancer risk, maintain healthy liver function and increase immunity. Red fruits and vegetables house essential phyto-nutrients and antioxidants such as lycopene which can assist in stimulating communication between cells and decreasing abnormal cell growth. Sufficient servings of reds support heart health and cardiovascular function. Blue and purple fruits and vegetables contain health enhancing flavonoids, phytochemicals and antioxidants. Ensuring a sufficient serving of these items supports health, reduces inflammation, encourages digestion, boosts levels of vitamin C and fibre and provides an excellent source of antioxidants.